According to reports the regime in Kabul is determined at all costs to engage Trump in the Afghan quagmire and to this end has so far made various unsuccessful attempts. In the latest of such moves, reports suggest that the regime has offered Trump – a entrepreneur turned President with many outstanding conflicts of interests – to invest and profit from Afghanistan’s many natural resources. America’s longest war received very little coverage during the recent presidential campaign. Even after Trump was inaugurated, so far he has shown no visible interest in this faraway theatre. On the contrary in his few remarks on the conflict during his campaign, Trump imbued contempt for such an unwinnable war that was shaking the very foundations of American economy and the unconditional support for the a regime that has stupendously failed to reign in corruption. The Kabul-based ‘Itla’at-e-Roz’ newspaper reports that the regime’s Ministry of Mines and Petroleum has sent a delegation to Washington to engage the White House and encourage it to invest in the country’s many untapped resources. Sources add that in order to entangle the Trump empire in Afghanistan, the delegation is offering to sell the nation’s gold and precious stone resources as well as its lithium reserves to the Administration. The delegation is also hoping that the Trump enterprise will invest in the country’s hydro energy infrastructure. An advisor to Ashraf Ghani – Humayun Qaoomi – has also told the Associated Press that Afghanistan has natural resources estimated to be between 2 – 4 trillion dollars and the Kabul administration is ready to partner with American companies to exploit these resources. A recent report by the New York Times similarly stated that so far the President has not made any statements to indicate a willingness to expend more lives or money in Afghanistan. 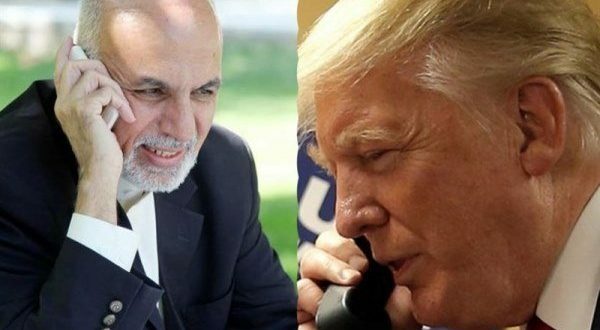 However in the brief telephone conversation with Trump, Ghani tried to highlight Afghanistan’s vast natural resources so as to entice the new President to undertake economic ventures in Afghanistan. It is possible that the prospect of such financial profit could tempt Trump to consider further investment in this country. According to analysts, having surrendered Afghanistan’s political and military sovereignty in the so-called Strategic Partnership Agreement, the regime still fears its imminent downfall and therefore is eager to surrender the country’s economic independence to Washington as well in exchange for a few more days in power. However the regime should know that the wealth of our nation is not their personal belonging that they can just sell off to anyone. The children of this land, having carried out a 16 year campaign to defend their land breaking the back of the enemy militarily, are similarly ready to defend the resources of our dear nation inch for inch in order to prevent its exploitation by any foreign powers. God Willing.